Pit bull dogs don’t know that they face discrimination. But their owners do. The one thing that the overwhelming majority has in common is that they’re responsible and law-abiding people. I’m Jon Bernthal. I’m an actor. I’m a father. And I’m a proud pit bull dog owner. 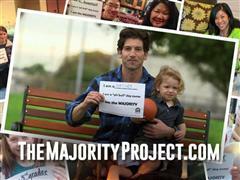 Join me, and thousands of others, at The Majority Project .com and take action by simply taking your picture.